The concept of “social dialogue” pervades discussions of labour relations in Europe. In the estimation of many scholars and policymakers, the concept opens the way to an entirely new and potentially transformative paradigm in deliberative democracy. But is the European social dialogue, as it is currently evolving, in fact contributing to a better balance between efficiency, equity, and voice—i.e., to a polity of good governance and a more equitable society? Who are the principals, who are the agents? Are the outcomes it is achieving to be considered successful, or are they disappointing? These are some of the questions addressed in this important new book. The author, who has extensive experience both in the academic and policy worlds of labour relations law at the EU level, describes, analyses, and assesses the European social dialogue from a combined theoretical and normative perspective. He applies theoretical strands stemming from industrial relations, EC law, and political theory to an understanding and assessment of the genesis, actors, processes, and outcomes of the European social dialogue through 2007, testing some of the leading theories and offering insights as he proceeds. He then investigates whether Articles 138 and 139 EC seem to engender good governance—i.e., whether such indicators as openness, participation, accountability, effectiveness, coherence, democratic legitimacy, and the contribution of the European social dialogue to a more subsidiary and proportionate decision-making at EU level are well-served by the ‘practice’ dimension of the social dialogue. Relevant EU legislation, European social partners’ agreements and ECJ case law are fully taken into account. In its elaboration of an integrated analytical framework for the European social dialogue, its assessment of whether the European social dialogue constitutes a polity of good governance and its insightful recommendations for improvement and further theory building, this book promises to become a landmark in the evolution of a labour relations theory that is attracting attention far beyond Europe as a global way forward in one of the most fundamental proving areas of the democratic polity. II. 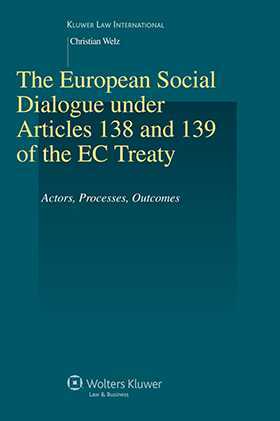 The European Social Dialogue under Articles 138 and 139 EC from a Theoretical and Normative Perspective. A. The European Social Dialogue from a Multi-disciplinary Theoretical Perspective: A Polity at the Crossroads. B. The European Social Dialogue from a Normative Perspective: A Form of Good Governance? III. Actors. 1. European Social Partners. 2. Representativeness of the European Social Partners. 3. European Institutions and Bodies. 4. National Social Partners and Governments. 5. Interim Conclusions: Evaluation of the Actors. IV. Processes. 1. The Evolution of the European Social Dialogue: From Paris via Val Duchesse to Brussels. 2. European Social Dialogue under Article 138 EC. 3. European Social Dialogue under Article 139 EC. 4. Judicial Review by the European Court of Justice and Dispute Resolution. 5. Interim Conclusions: Evaluation of the Processes. V. Outcomes: Successes versus Failures.